These invitations are so vibrant and fun! 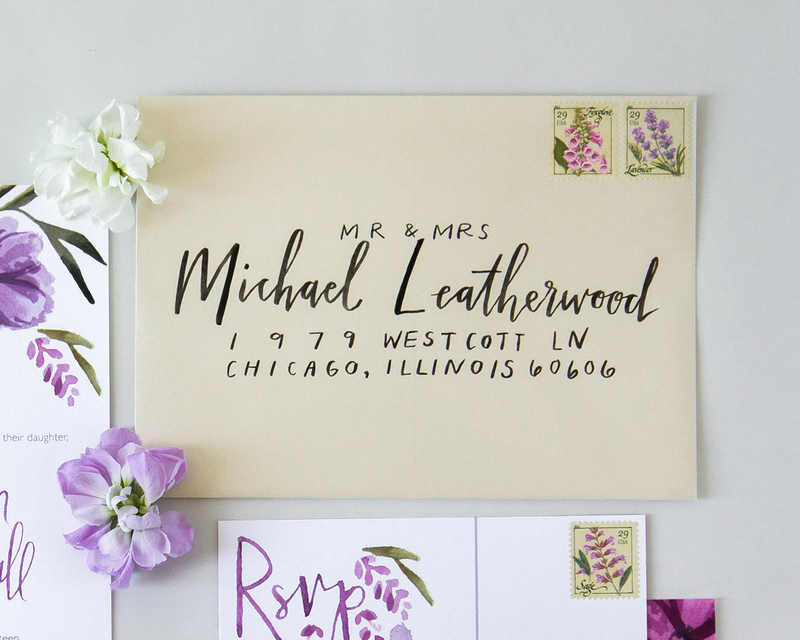 Kyle Sommer of Sommer Letter Co. created these vibrant purple floral watercolor wedding invitations for an elegant-meets-casual summer farm wedding for two high school sweethearts in Indiana. The floral illustrations and watercolor hand lettering are the perfect match for a summer barn wedding! From Kyle: Taylor and Jalen, high school sweethearts, came to me looking for a beautiful way to capture the vibes of their dreamy summer wedding in Indiana. They had chosen an amazing variety of purples for their wedding colors: a mix of lavender, violet, amethyst, and lilac. The couple chose to get married at Joseph Decuis Farm, an event space that describes itself as “a farm dressed in a tuxedo.” It truly carries a formal vibe in an unexpectedly casual environment. Throughout the design process, we tried to walk that line between formal and friendly. Taylor told me she wanted to keep things elegant, but also reflect the casual barn wedding atmosphere. She really emphasized that she didn’t want the event to feel stiff – she wanted her guests to feel at home. I really wanted to carry that breezy, summery, barn wedding feel into the wedding invitation suite. We decided a hand painted floral bouquet would be the perfect fit. It would capture the beauty and elegance of florals, but we gave it a bit of an “undone” look by imagining a bouquet with a few loose leaves poking about, and a handful of lavender stems drooping downward. We chose to feature their names and titles with a bit of large, scribbly, watercolor hand lettering. To top it off, Taylor chose a shimmery champagne envelope and vintage floral postage stamps. We kept the outside of the envelope fairly traditional. I chose to write names and addresses in a simple brush pen lettering style. Guests would receive formal, traditional looking envelopes, but open them to discover rich purple hues and the couple’s welcoming vibes. Design, Styling, & Lettering: Sommer Letter Co.